Anne Frank may have been caught 'by chance', not betrayed, says a researcher..
Anne Frank may have been discovered "by chance" and not because she was denounced to Holland's Nazi overlords by unknown betrayers as long thought, the museum in her honor says. New research suggests, but does not prove, that the August 1944 police raid in which Frank was arrested may have actually been staged to investigate illegal activity taking place elsewhere in the building. "The question asked has always been 'Who betrayed Anne Frank and the people in hiding?'" the Anne Frank House said in a statement published Friday. The general belief is that it was the Dutch themselves, as some 90% of Dutch Jews were murdered in the Holocaust, most turned in by the Dutch police. But at 263 Prinsengracht in Amsterdam, where Frank and seven others went into hiding in a secret upstairs annex, "illegal work and fraud with ration coupons was also taking place." dedicated to preserving Frank's memory. The Anne Frank House, in addition to the story of the Frank family, has been allowed to become a display center for Palestinian Arab propaganda for many years, a fact which shocks many first-time visitors. 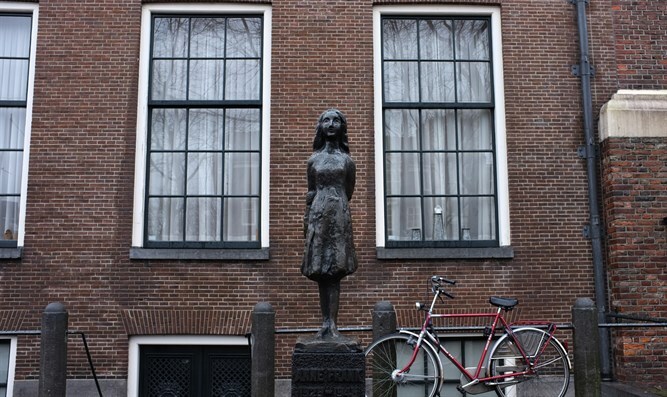 "The Anne Frank House's new investigation does not refute the possibility that the people in hiding were betrayed, but illustrates that other scenarios should also be considered," said Ronald Leopold, its executive director. "The Diary of a Young Girl," which Frank penned while in hiding from June 1942 to August 1944, is one of the most famous testimonies of life in the Second World War and the most famous diaries of all time. It has sold more than 30 million copies in 67 languages. Frank, who was born in Germany before her family emigrated to the Netherlands, died in the Bergen-Belsen concentration camp in Germany in early 1945, aged 15, less than a year after her capture and just before the end of World War II. Her father, Otto Frank, was the sole survivor of the war among the eight inhabitants of the secret annex. It was commonly assumed that Frank, her parents and sister, as well as four others, were betrayed by an acquaintance to Nazi authorities - with fictionalized accounts sometimes referring to an anonymous phone call. But researcher Gertjan Broek honed in on details from Frank's diary about two men who worked in the building illegally trading in ration cards, and who had been arrested in March 1944 for it. Broek said that activity "obviously ran the risk of attracting the attention of authorities," but does not prove that the events were connected. "Hopefully it will also inspire other researchers to pursue new leads. Clearly, the last word about that fateful summer day in 1944 has not yet been said," he wrote.